Canada’s housing market is sizzling hot and the Bank of Canada has a monetary policy dilemma: increase interest rates to cool the housing market would hurt borrowers and the economy; keep interest rates low adds fuel to the borrowing that led to the rise in housing prices and in household debt. What to do? The latest national data on house prices in February suggest a year-on-year increase of 9 percent. House prices in Vancouver and Toronto—that contribute about a third of Canada’s GDP—have led the increase. Canada’s housing boom has been accompanied by a steady rise in the nation’s household debt to 165 percent of disposable income by the end of 2015 (see chart). One way to cool the housing sector is to increase interest rates, but that would hurt the slowing economy, which has been hit hard by the decline in oil prices. Hence, the dilemma. Low mortgage rates are an important factor feeding the housing market boom. This has helped keep interest payments low even as the size of the average mortgage has risen. 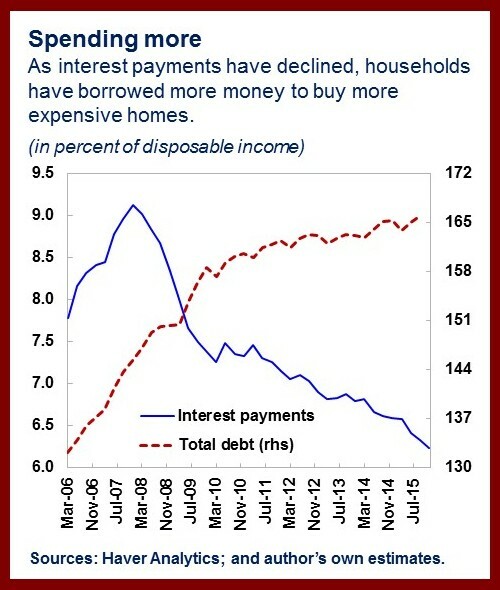 As the figure shows, the share of interest payments in households’ disposable income has declined from 9 percent in 2008 to 6 percent in 2015, while the average size of mortgages has increased by some 40 percent over the same period. This means more households are able to afford more expensive homes, which, in turn, prompts households to borrow more money and get further into debt, while house prices continue to be pushed upward. This process should continue as long as employment is robust and interest rates remain low. The Bank of Canada is rightly concerned about the rise in household debt, which makes the economy more vulnerable to unanticipated shocks and financial strains more probable. A mini version of this is playing out in Alberta, which has the third highest level of household debt among the provinces—after British Colombia and Ontario—and was hit by a large terms of trade shock from the oil price decline. The Alberta economy is expected to have contracted by almost 2 percent last year amid massive layoffs by the oil industry and house prices fell by 4 percent since their peak in late 2014. A solution would be to raise interest rates to cool the housing market. But it is not as simple as that. Tightening monetary policy could further weaken the Canadian economy that has already suffered a traumatic oil price shock. Greater wealth that comes with higher home values encourages households to spend, generating income for businesses and new opportunities for venture companies. Indeed, the strength of private consumption was instrumental in offsetting the sharp decline in business investment in the resources sector and helped the economy grow by 1.2 percent in 2015, following a recession in the first half of the year. A new paper by Andrea Pescatori and Stefan Laseen supports the Bank of Canada’s decision to cut the policy interest rate in response to the collapse in oil prices early last year. The authors found it unlikely that the benefits of having a tighter monetary policy would outweigh the costs when the economy is weak. Benefits in reducing household debt accrue slowly over time, peaking 8 years after the monetary policy action, while costs in the form of higher unemployment are paid upfront within the first two years. It would only pay to “lean against the wind”—raising interest rates beyond the level necessary to maintain price stability to limit the buildup in asset prices—if credit grows excessively fast (more than 9 percent annually) and the cost of a financial crisis is severe. To be sure, there is considerable uncertainty around these estimates. But they are not too far off from the Bank of Canada’s own estimates. Compared with the Bank of Canada, the authors find that the same amount of monetary policy contraction (100 basis points) have a smaller effect in reducing household debt (by 1.25 percent versus 2 percent after 5 years) but also in reducing GDP growth (by 0.75 percentage point versus 1 percentage point). There is much still to understand about the relationship between monetary policy and financial stability risks. Pescatori and Laseen’s paper is an important contribution of a long process to examine this relationship based on empirical evidence and rigorous analysis. For the time being, the Bank of Canada is following a sensible risk management approach, using judgment in weighing financial stability considerations in its conduct of monetary policy. While monetary policy is the focus of the blog and the working paper, macroprudential policies and measures are also an important part of the tool kit, and should be the first line of defense in addressing financial stability risks. The IMF will continue to provide its assessment on the effectiveness of macroprudential measures in Canada, and a discussion of this topic goes beyond the scope of the working paper and the blog.